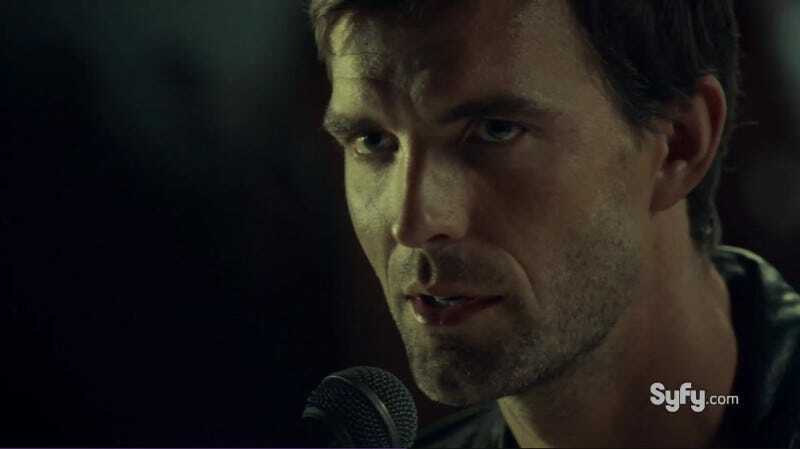 This week’s episode of Haven makes Nathan account for his actions (sort of). Audrey is still looking for the source of the darkness Trouble and Duke tries to handle a Trouble in Nova Scotia. Spoilers ahead. Because Dwight and Charlotte have left the school to find Kira and the aether. Charlotte drops another infobomb along the way. There is “a far greater evil” that lives in the Void and feeds off aether and Troubles. They find Kira (and the aether) and return with the very much alive Kira. Audrey tracks down the cause of the darkness Trouble and of course it turns out to be Tony. Nathan’s speech helps him overcome his Trouble. Tony had a period of lost time (like the Teagues brothers earlier in the season) and found a book with the info about Nathan when he woke up. Meanwhile in Halifax Duke has to deal with Hailie. She uses her new found Trouble to rob a bank but a cop interrupts their getaway. She is shot and her blood sets off Duke’s Trouble killer mode. Hailie manages to trap Duke in a shipping container. Audrey finds a Troubled man she helped earlier asleep with his eyes open. She realizes what happened just as the Sandman puts her to sleep. The “greater evil” feeds off two things Haven has a lot of right now - Troubles and aether. Charlotte keeps mentioning her husband who we find out was a victim of the evil in the Void. So he’s probably going to show up particularly now that Charlotte and Dwight are back together. Charlotte also says she needs a being from her world to help work that much aether. Dwight says Audrey but I think she’s thinking more of Mara, someone already experienced in working with aether. There must still be a little of her left in Audrey. The verdict was not announced. Will it matter later on? Or has Nathan received a free pass? The next episode is titled “Enter Sandman” so it looks like we’re off to Dreamland.